TY Harbor Wheat Ale is a 4.5% wheat ale from TY Harbor Brewery, based in Tokyo, Japan. It’s part of their all-year round range and can be found in both bottles and on tap. It’s brewed to a traditional Belgian style white ale recipe. Yes, this is the draft version review of a bottled beer but for some reason, I’ve yet to come across this beer in bottles! 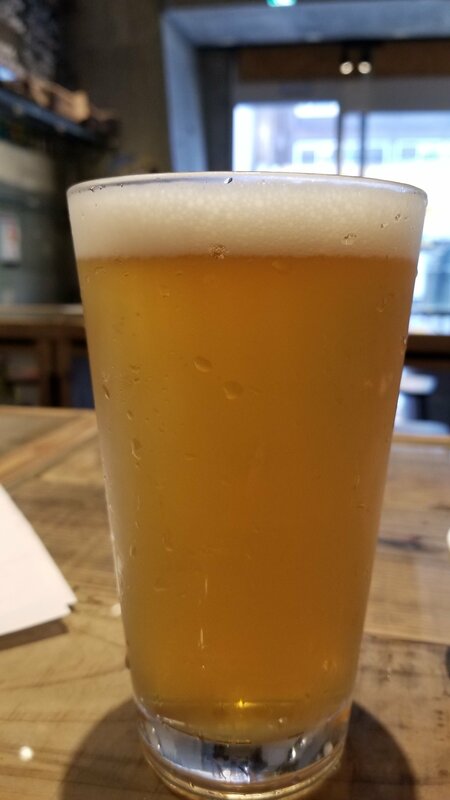 TY Harbor Wheat Ale came up a very hazy dull golden yellow colour with a plump white head on top that clung to the side of the glass throughout drinking. There was a distinct banana, wheaty nose to the beer, and some hints of creamy oats came through too. The yeast brought a subtle funk to the aroma but stayed solidly in the background throughout drinking. The body had a crisp, wheat bite to it, that was punctuated by some banana and cloves to it. It didn’t have the body of a Belgian wheat though – it seemed to be more of a hefeweizen than anything else. The light body I had expected was actually much heavier than I thought – a shame as I was hoping for something crushable on a hot summer day’s. It ticked all the right boxes for a hefeweizen – yet it’s not technically a hefeweizen. The lingering banana and clove flavours kept reminding me but after a pint and some long walking, I forgot about TY Harbor Wheat Ale was a wheat ale. As a wheat ale, TY Harbor Wheat Ale isn’t very good. As a hefeweizen, it’s a decent representation.